We are proud to support this program with the Challenger Division to help coaches raise money for their team functions and activities. You can read more about who they are and what they do http://www.littleleague.org/learn/about/divisions/challenger.htm”, and they have more information here and here too. The I See The Crowd Roar package includes a DVD of the documentary film located inside the back pocket and offers a free digital copy of the book. 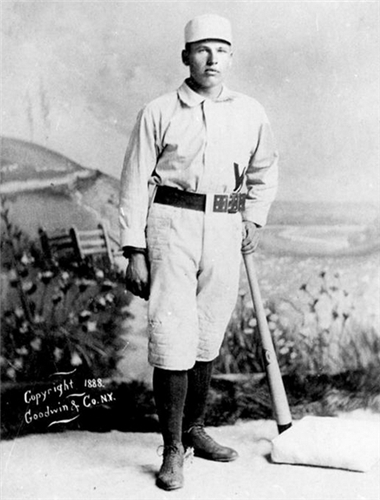 The book and video document the life of William “Dummy” Hoy a professional baseball player from the late 1800’s. William Hoy’s story is both amazing and powerful. One of Major League baseball’s first deaf players, Hoy’s life and achievements on baseball fields are chronicled from his youth to the closing of an amazing 14 year major league career. Despite his hurdles, he became an outstanding Major League Baseball player. He lived his life on and off the field as a CHARACTERED man. Learn of his many achievements on the field, including being credited with the creation of hand signals still used in baseball today! The book teaches what it means to be a CHARACTERED© individual. Courage, Honesty, Accountability, Respectfulness, Authenticity, Commitment, Trustworthiness, Ethical Behavior, Responsibility, Enlightenment, and Disciplined Behavior – all traits that William possessed and lived! These are virtues that society values and that make a person a better citizen, neighbor, and friend–just like William Hoy. I See The Crowd Roar fundraiser supports the mission of Challenger Division Baseball in a powerful manner. Inspires Challenger Division players and supporters to overcome obstacles life presents to achieve goals and dreams. Assists Challenger Division in earning money – 40% profit to team and 10% to Division with complimentary copy to team members*. Allows Challenger Division players and supporters to be involved in getting William Hoy elected to the National Baseball Hall of Fame. Hall of Fame Postcard – print, stamp and mail.